It is October, the month of wine-festivals. From way back people have celebrated the grape harvest in this month, just as August was full of festivities when the grain was harvested. In this way they expressed their thankfulness. In the image above we see a grain and grape harvest that seem to take place at the same time, but without any trace of festivities. 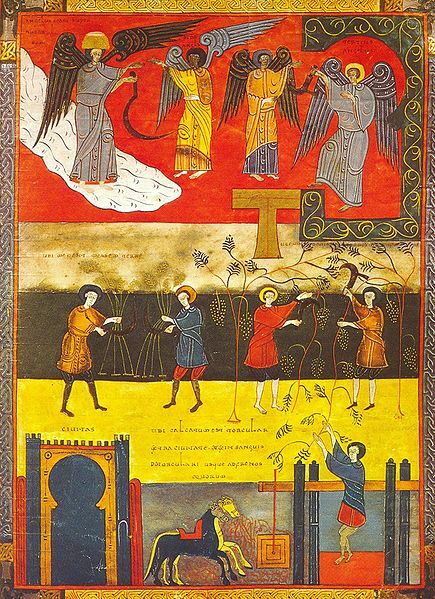 It is an illustration of Revelation 14:14-21 from the so-called Beatus Facundus. Beatus of Liebena was a monk who lived in the 8th-century kingdom of Asturia in Northern Spain, the only part of Spain that was not ruled by the Islam. On the basis of texts by early Christian writers Beatus compiled a commentary on Revelation. He divided the Bible book in 68 storiae and between the text and the commentary on these storiae he placed illuminations. In this way he probably wanted to help his fellow monks to get into the text and meditate on its meaning for their own life and the future of the earth. After all, this book deals with the history and end of the world. In line with this Beatus also included genealogical tables of Adam to Christ, a map of the world, and a commentary on the book Daniel. In the following centuries the Beatus manuscript was often copied in other monasteries in the Christian part of Spain. The style of the copyists makes clear that they were not only familiar with French art but also with the Islamic art of their time. Each illuminator built in his own way on the work of his predecessors. So too did Facundus who made a copy in 1047, this time not commissioned by a monastery but by King Ferdinand I and Queen Sancha. His manuscript, the Beatus Facundus, is one of the most well-known and most beautiful. When we look at this one page, we are struck by the strongly stylized figures and the bright colours. Horizontal strips form the background which is without depth. The style is neither naturalistic nor realistic, yet the miniature is definitely showing a reality. This we discover when we, just like the first users, put Revelation 14 next to it: the text is almost literally portrayed. In the upper red strip we see someone on a white cloud with a golden crown on his head and a sharp sickle in his hand. Two angels are coming out of an arch-like opening depicting the temple. The one summons up to the grain harvest, as the harvest of the earth is fully ripe, the other one carries a sickle. A third angel comes out from a golden T-form, an altar, and summons up to the grape harvest as the grapes are ripe. In the strips below this the grain and grapes are being harvested. At the bottom we see a gate in the form of a horseshoe that is the entrance to a city. Outside the city we see two horses next to a wine press. It is blood and not wine that comes out of the press in long streams as high as a horse’s bridle. But what is this ‘cartoon’ about? It deals with Christ’s return to the earth at the completion of history to gather the fruits of his labour. All who have lived in communion with him are brought together in the New Jerusalem. But his enemies will not enter there. They will perish in the wine press of the wrath of God. The monks knew that God would come with his judgment, also on them. We can imagine that in their daily meditation of God’s Word they responded to the appeal of text and image and prepared themselves for the feast in the celestial city (Revelation 19). Did the king and queen do this as well or was the manuscript more of a status symbol to them? We do not know.